As noted in Cardplayer Magazine, The Eastern Poker Tour has been recognized as giving out the most nightly prizes in any bar poker league nationwide! In addition to the $100,000 you can play for through our season championships, monthly championships, team championships, and national championships? 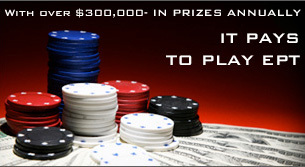 We also award over $1,000,000 in nightly prizes every year to our players!! We do not and we cannot allow players to "pool" money based on a per person table. Although, what we can do for you is give out more nightly prizes out every time we hit a new participation milestone! We hope you appreciate these generous bonuses that we provide on behalf of our partnering venues. The more people that participate, the more likely that we will hit the participation milestones and be authorized to give out even more prizes for the players, so spread the word about Eastern Poker Tour and our partnering venues and reap great nightly prizes! Actual amounts per place could change slightly based on TD Discretion, the total amount should always be consistent based on actual promotion being advertised.